Blizzard has just launched the 2008 version of BlizzCon.com (but that site still redirects elsewhere). You can find the site at Blizzard.com/Blizzcon. 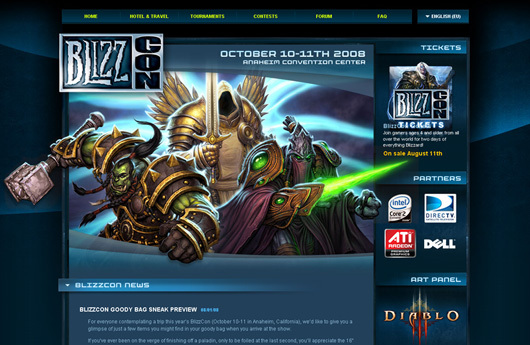 We just released the official BlizzCon 2008 website. You can now find new information about this year’s panels, contests, and tournaments, and you can also learn more about DIRECTV’s special BlizzCon promotion. Make sure to check back regularly as the site will be updated with new event information such as event schedules, floor plans, store info, and much, much more. The website also helps you to find ways to get there as well as finding hotels, and will probably fill out with a bit more information before the event. Remember! The tickets are being released on Monday! While they will use 50% more space this time around, the tickets will probably sell out fast as usual.